A cast bronze vase of compressed globular form, the smoothly rounded sides rising up to the small mouth, which has a short rim. The upper part of the vessel is cast in relief with a band of overlapping inverted heart­-shaped lappets. 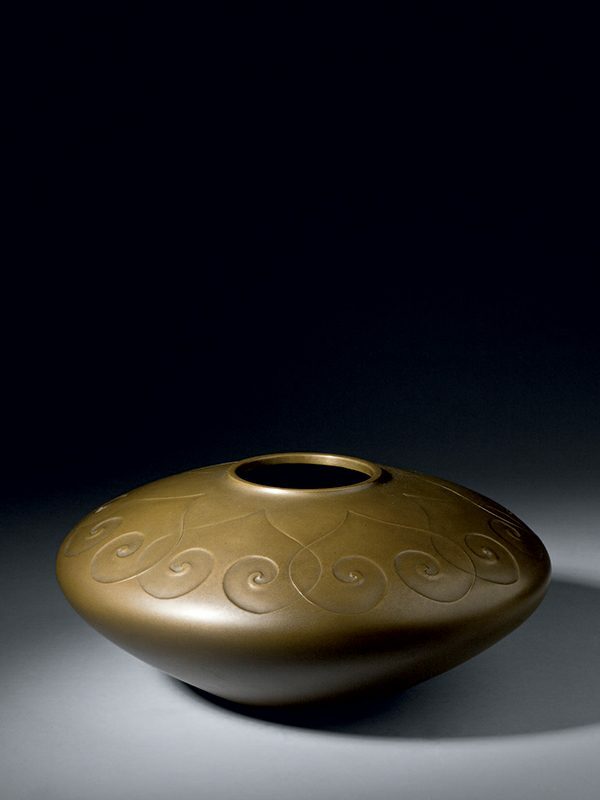 The slightly recessed base is stamped with the artist’s signature, Toshi. The bronze has an attractive, light brown patina. The original tomobako is inscribed on the outside Uzumon chūdō kaki (spiral pattern, cast bronze flower vase) and on the inside: Hongō Toshihiko with the seal Hongō Toshihiko. The artist of this fine vase, Toshihiko Hongō, learnt metal work under his father Yoshihiko Kakuho. Since 1700 the Hongō family was engaged in the metal crafting business in Ishikawa, particularly producing works with Kaga work, a technique of inlaying mixed metals into a bronze or other base metal. Toshihiko subsequently became a member of the Kaga Metal Craftsman association, based in Takaoka City, in Toyama prefecture. In 2004 he was appointed a Dento kogeishi, or traditional craftsman by the Ministry of Economy, Trade and Industry. Toshihiko exhibited at the Japan Art Crafts exhibition seventeen times and won many awards, including an award from the Tokyo Metropolitan Government Board of Education.